The City of Sciences is something very special; it offers you a unique and positive outlook in to the future. Its design is absolutely breathtaking, as you escapade in awe through one of the most experimental manmade worlds known to man in the 21st century. 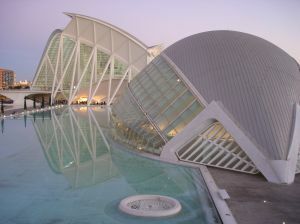 The Cuidad de las Artes contains the four sites, Palau de les Arts Reina Sofía (Queen Sofia’s ArtPalace), L´Umbracle, L´Hemisfèric (The Hemispheric), El Museo de las Ciencias Príncipe Felipe (Prince Felipe’s Museum Of Science). L'Umbracle is portal to the City of Arts and Sciences. A green zone of 7.000 square meters, 320 meters of length and 60 meters of width. It consists of 55 fixed arches and 54 floating arches of 18 meters of height. The Gothic Cathedral and its Miguelete (Tower) sit in Valencia's historical centre where once stood a Mosque. Consequently, construction started on the Cathedral in the 13th century until it was eventually finished in the 17th century. Due to this extremely large period of construction, the architectural periods were mixed, yet gothic is seen to be the foremost. Opening hours; Monday- Saturday, March- November; 13.00h and 16.30h – 19.00h then from December to February it is only open until 18.00h. Admission: €1.20. On the main entrance, is claimed to holda relic of the Holy Grail; a cup from the 1st century AD which, which the legends say Jesus sipped during the last supper. On the Cathedrals exterior, there is the Puerta del Palau (Palace Door). This is the church's oldest element, in Romanesque style with Mudejar elements, a 15th century Apostles' door. It here every Thursday at Midday, the Tribunal de las Aguas meet. This is an association, formed by King James I of Spain in the Middle Ages. Traditionally, eight rural workers are chosen every two years by Valencia farmers. Its objective is to settle arguments about irrigation, which still occurs to this day. Past the Holy Grail there is a Museum. Opening hours; Tuesday – Sunday, 10.00h – 12.30 and 16.30h – 18.30h. Admission: €1.20. Here you can spiral up 207 steps for a great 360 degree view of the city. This charming plaza was once the forum of Roman Valencia, where its main highways merged. Today it is the place where there are horses and carriages to carry the people on a fairy tale tour through the city. This Church is beside the Cathedral and it holds a venerated statue of the Virgin. Opposite the Church there is also the Palau de la Genralitat, (the government seat for the Valencia region.). La Lonja was constructed in 1483 by architect Pere Compte. It was funded by the city's merchants to become their headquarters for contracting and as a consulate for sea trade. As a gothic style building, today it is a World Heritage site. The building is segregated into three branches: a market, an interior garden, and the consulate with its tower. Opening hours: Monday – Saturday: 09.15h – 14.30. Constructed in 1928, this market is well worth a visit. Just to see the great quality and finest ingredients that the area has to offer. Opening hours:Tuesday – Saturday, 09.15 – 14.00 and 17.30 – 19.00, Sunday, 09.00 – 14.00, admission free. Erected in 1392, to guard the main entrance to Valencia, the Towers of Serranos are one of the former 12 front doors of Valencia, when it was a walled city. In 1865 the walls were demolished, but the Towers of Serranos and the Towers of Quartwere respected.